Not every trip is going to need a giant container for food and drinks. 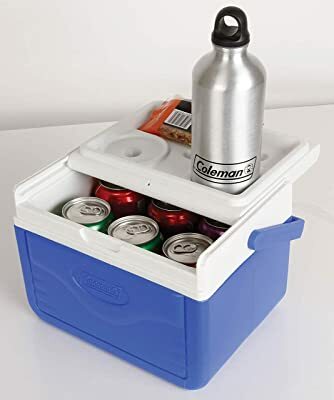 If it is only a single person that is traveling and they are not going far, then a normal cooler is impractical to carry. Smaller, personal coolers exist that provide all the benefits of their larger counterparts. They have the added bonus of being far more portable than a normal cooler. This guide will cover eight of the best small coolers that money can buy. 3.1 1. How long will it Keep Things Cold? 3.3 3. How well can it Handle Water? 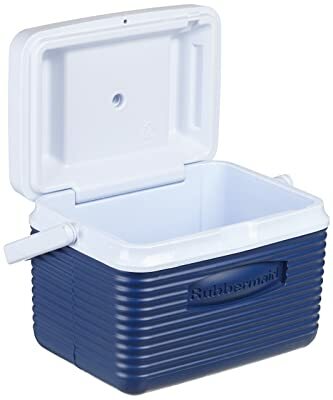 As the description implies, a small cooler is one that is small and meant for a single individual to use. While this may appear counterproductive, here are a few reasons why size does not matter. A small or personal cooler is one that a single person can carry around with them. This makes them perfect for travel that will less than a day, such as a trip to the park or even packing a lunch. A typical small cooler will also be a bit bigger than a normal lunchbox, so they offer more space than they do. This is not always the case, but smaller coolers are usually made from soft and flexible material. While this does sacrifice some of the durability, the tradeoff is a cooler that, when empty, will not take up much space. There are also personal, plastic coolers available for people to use, though. Many people will use personal coolers for day trips to pack their lunches, so they will not need to use actual ice. Ice packs are often used to keep the food and drinks cold without the risk of melting ice. In fact, some of the cheaper small coolers may not be able to handle water from ice. A few are watertight, but they tend to be more expensive. No matter if a cooler is big or small, as long as it does its job of keeping its contents cold and comfortable, then it works. Personal coolers are as capable of keeping food and drinks insulated and preserved. They will do a better job than a simple paper bag will, and are reusable. Why settle for an ordinary cooler to pack food and drinks when you can have more? Introducing the Coleman FlipLid, a personal cooler and portable table for any event! Large enough to hold six cans of drinks, there is more than enough space for a full meal. At the same time, it is also small enough for someone to carry wherever they need to go thanks to the bail handle. Once at the destination, open the Coleman and get ready to eat right on the cooler. The secret is the FlipLid: open the top and reverse it to turn it into a table. The FlipLid has a beverage holder built molded into it to provide a stable surface for drinks. Once done eating, close it up and get ready to move on. The top is easy to clean and wipe away any mess made. That is not all it can do, though! Happy customers have used the Coleman FlipLid to make clear ice, and it works great! One customer said that the ice came in clear, save for the bottom where all the bubbles went. Another customer said that it is easier to clean than fabric based lunch containers and has less risk of pathogens. At the same time, there have some complaints about the lid and handle. One customer said that it was “shotty” and cheap. Another customer said that there are problems with lack of insulation. On the plus side, it is still good at making ice. Since 1913, Stanley has committed itself to providing the kind of rugged gear for food and drinks that can last a lifetime. That reputation has served the company well for a hundred years. Now, Stanley commits itself to its work once more with the Stanley Adventure Cooler. 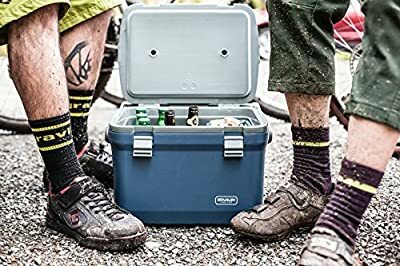 According to Stanley, the 7 quart Adventure Cooler can hold the goods, and keep them cold, for 27 to 36 hours. That is 40 percent longer than a normal cooler. That is an impressive feature. The secret to this extra time comes from the double wall foam used as insulation. The insulation extends to not only the body of the cooler, but the lid as well. That is a good deal of insulation. 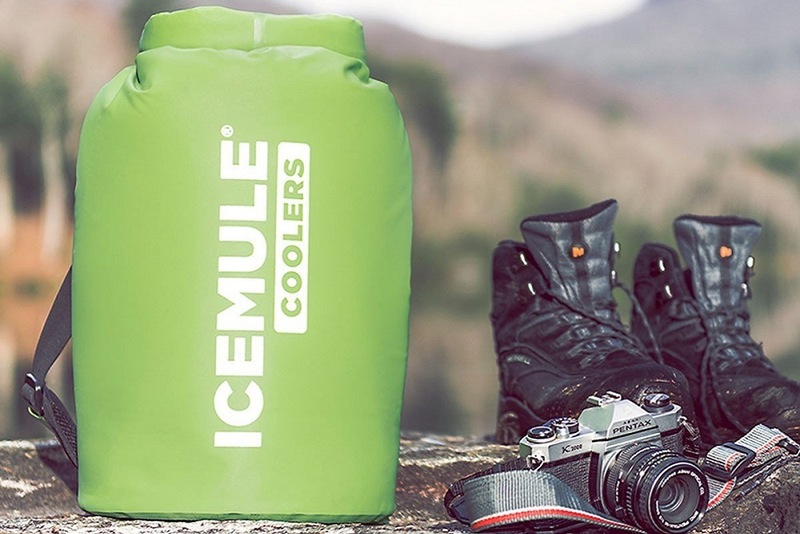 The Adventure Cooler has dual gaskets that are leak-resistant and keep the cold in. The latches and hinges provide for extra durability. On the outside, the lid has an adjustable tie down for any thermos or water bottle, while the handle provides a strong grip. The Adventure Cooler is durable enough to double as a makeshift seat. The Stanley Adventure Cooler comes in two sizes, a 7-quart and a 16-quart. Each can handle a good deal of food and drinks, up to 21 cans in total. Sad to say, but the even customers who liked the Stanley have said that cannot stay upright with weight on it. In other words, they flip over very easily. This seems to be an issue across several Stanley products, so it is not the cooler’s fault. The plastic on the handle can be thin, too, and break off. One customer solved the flipping problem, though. What this customer did was remove the handle and the screws, took about half an inch off the handle, and made new screw holes. Then put the handle back in, and it should keep it upright. Easy fix! Easy fix to the cons below. There are six different sizes of the Yitour Insulated Soft Cooler Bag, and this is the smallest of them all, at 10 liters. Regardless, all versions of this have durability in mind, so people will not need to worry about their food and drinks. All told, it can keep food and drinks cold for at least 12 hours. The plastic liner inside is also removable for when the time comes to clean it. Aside from the inside, the Yitour has four mesh pockets that are the perfect places to keep to essentials dry and safe. There are two side pockets, one on the front, and one on the back, great to keep keys, wallets, and phones in. Thanks to the Oxford fabric, this cooler bag is touted as being waterproof. Yitour tested it in a hundred different scenarios to be sure. If anything happens to it, the cooler comes with a three-year warranty. The one flaw that customers have mentioned is that the lid has no zipper to attach the top to the bottom of the cooler. Other than that, they have had nothing but nice things to say about it. It should be noted, though, that this is not meant for long term activities outdoors, due to the 12-hour range on it. Built to be both comfortable and portable at the same time, the Mojecto Cooler Lunch Bag’s made to make customers happy. Made from a variety of heat-resistant materials, this cooler bag will keep items cold for a long time. On the outside, the Mojecto Cooler’s made from premium 600D polyester to protect what is in it. Every side of the bag has high-density foam insulation, and the inside has a thick lining of Peva. In short, the cold stays in where it belongs. On the outside, this bag has extra accessories to spare. There are several pockets for keeping belongings safe and secure. Aside from the main container, there is a front and back pocket for important items. Two side pockets are the perfect spot for drinks. There is a zippered pocket underneath the lid on top as well. Speaking of zippers, the zippers on the Mojecto are of premium quality and meant to be strong. The bag also comes with anti-slip shoulder straps, making it easy to carry. It should be noted that this bag is not meant for loose ice or any other kinds of liquids. The manufacturers recommend that only using ice packs and ice gels. Aside from that, this bag is great to take to school, the office, sports events, or picnics outside. At Fit & Fresh, they strive to make sure people have products that help them stay healthy while also being trendy and fashionable. With their all-purpose small cooler bag & lunch box, they have done that. 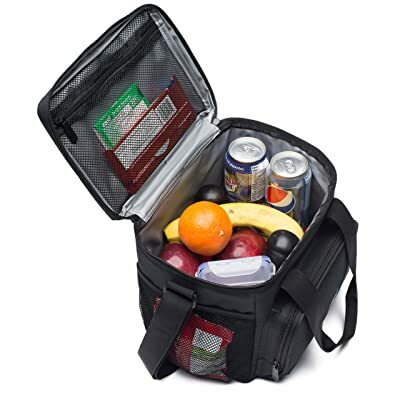 With its easy to carry size, this cooler bag is great for any day trip in the great outdoors. 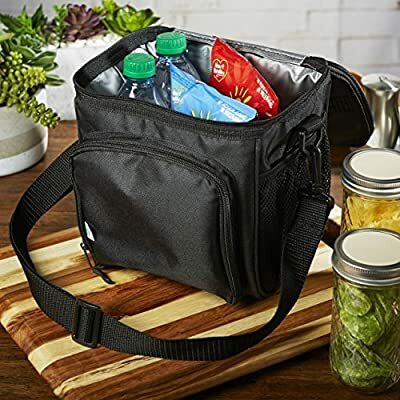 The main compartment is covered in BPA-free PEVA that is easy to clean in case of messes, and can hold half a dozen water bottles. If that is not enough, there are four extra, zippered mesh pockets. One in the interior of the bag, two on the exterior, and the front pocket for keeping keys and other valuable items. To provide the best in movement, this cooler bag has a detachable strap and two reinforced handles. A person can sling it on their shoulders; carry it with one hand or with two. When not used, it can be folded and put away for easy storage. Aside from a few complaints about the zipper, the biggest issue a customer had is with the shoulder strap. Apparently, it makes an annoying sound coming from the connection between the strap and the bag. Other than that, nothing out of the ordinary. Great for all outdoor activities including camping, picnics, parties, and more! A simple cooler/lunch box, the Everest Cooler Lunch Bag is a straightforward way of keeping food and drinks cold. 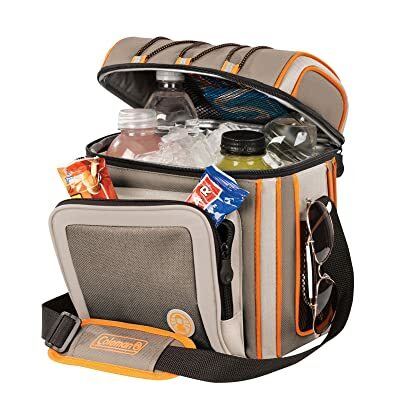 Compact, lightweight, and insulated, this product has all the basic amenities people are looking for in a small or personal cooler. The interior of the bags lined with vinyl, making it easy to clean and providing plenty of room for food and drinks. The entire bag can be closed up by a zipper and opened in just as easy a fashion. For extra space, there is a zippered pocket on the front, perfect for keeping napkins and eating utensils. The side-mesh pockets are good for holding packets or other items. To carry it around, the Everest comes with a strap that is adjustable from anywhere between 24-46″. This cooler bag is as basic as we can get when it comes to these items. That has its pros and cons. 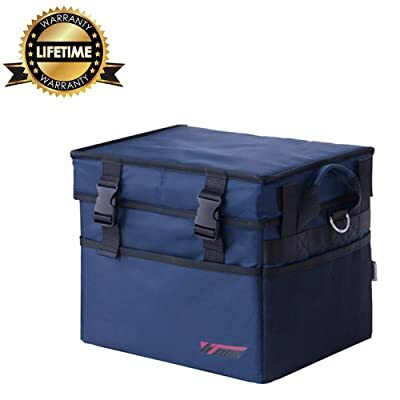 Customers have said that this is neither the best nor the worst cooler bag out there. One even said that it is more a lunch bag than a cooler, because it does not keep frozen food frozen. Another said the zippers break too fast. Still, this is good enough to get the job done. Another Coleman product on the market. Their nine Can Cooler is a simple yet effective product. The main compartment contains lining guarded by antimicrobial products designed to resist mold and odors. The liner is also capable of removal for easy cleaning. To prevent leaks, the seams are heat-welded to provide for the best in waterproofing. Like many other hybrid cooler bags, the Coleman 9 Can has extra pockets. 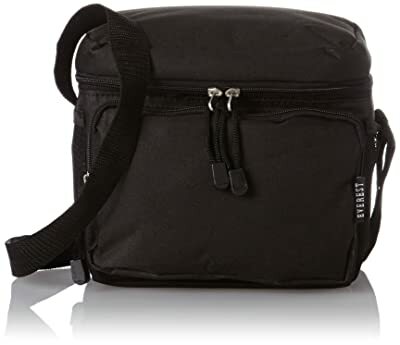 In this case, it has a zippered front pocket to store extra snacks or other small gear, with a bungee cord on the lid to provide access. The shoulder strap may adjusted for comfort so that a person may carry it on their shoulders. Be warned, though. Because it is simple in design, it may not hold up as well as other bags. Some customers have said the lining starts to thin out in less than a few months. Be careful about what you put into this bag to ensure it lasts as long as it can. Its small size can also inhibit its ability to carry things, as well, so that can be an issue. For 80 years, Rubbermaid has represented innovation and high quality products. 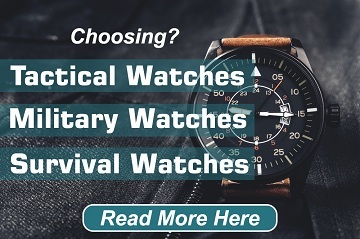 They commit themselves to ensuring they stand for durability and innovation. As such, the Rubbermaid Victory Cooler provides all that. The Victory Cooler has great thermal retention due to its double-walled construction. With the lid safe and secure, it will keep the heat out so beverages stay cold. The top handle can open up and swing as free as possible. When not used, put it back in snug and secure. If spills occur, the liner is easy to clean. The 5-quart model of the Victory Cooler promises all these things, but in a smaller package. Someone can carry it around with one hand as they go to work, eat lunch, or take a day trip. It is big enough to hold six drinks plus the ice to go with them. It is a great personal cooler, altogether. The only complaints available are the ones to be expected: it is too small; it does not keep the cold as well. This can happen to most coolers, though. Do not let it discourage you. Before you decide to buy, there are a few things that you might want to consider about that small cooler. 1. How long will it Keep Things Cold? The whole purpose of a cooler is to keep the things inside of it cold and preserved. How long it is able to do that is an important thing to consider. Most personal coolers will only be able to keep contents cold for a day or less. Depending on where you plan to go, that can determine what kind of personal cooler that you are looking for. How much these things may be able to carry is not going to be as great as larger coolers. Depending on the model, though, that will determine how much a small cooler is able to carry. Some are able to have room for a lot more. 3. How well can it Handle Water? Since these may be meant for the use of ice, it is important to know if a cooler can handle water very well. Some coolers fare better than others on this front do. Make sure that whatever cooler you get will not leak water from anywhere, or let water seep in. Size does not always matter in life. Sometimes, what matters is how much can be done with something. These small coolers are just some of the hundreds out there that can provide all the necessary functions of larger counterparts. From going on a long car drive to packing a lunch to work, people use them on a daily basis. They are a much better investment than using a paper bag every day, as they keep food and drinks nice and tasty until they are ready to eat.